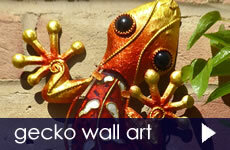 Choose from a colourful selection of geckos, available in various sizes and designs made either from metal, or glass and metal. You'll find butterflies, dragonflies and frogs in bright colours, plus an eye-catching ladybird and also a bumblebee in this category. 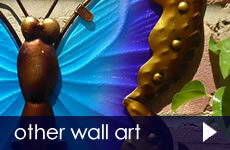 Described as wall art, it doesn't mean you can't hang any of these colourful items on a fence or a tree trunk. The geckos look particularly good sunning themselves on a flat stone in a rock garden.